"My motto is 'I treat patients the way I would want somebody to take care of a beloved family member.' My personal style includes getting to know my patients a bit over time, helping them through the illnesses that may come their way, or seeing them for their annual exam year after year. Being a patient advocate is also an aspect of caring for patients that I enjoy. Often patients or their families need help navigating through the maze of healthcare and I like to be able to lend that helping hand as well. I enjoy seeing women of all ages for their female health needs, including annual exams, STD testing and treatment, contraception, and health maintenance. Menopausal women have unique needs and I enjoy working with them, prescribing bio-identical hormones if indicated, to maximize their quality of life. I love my profession and I am happy to be part of the team at San Diego Sports Medicine & Family Health Center." Tess grew up in Philadelphia, PA and earned her Bachelor of Science degree from Villanova University in 1988. For 12 years she worked as an ER and ICU RN at various teaching hospitals across the US. In 1999, she earned her Master of Science degree from the University of San Diego. She is a Board-Certified Family Nurse Practitioner, licensed by the State of California, and has full prescribing certifications. 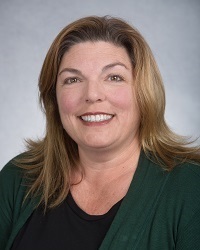 Tess has worked in family practice and urgent care throughout her NP career, served as Clinical Faculty at USD, and is currently Adjunct Clinical Professor at San Diego State School of Nursing, College of Health and Human Services. She has 18 years of experience as an NP, 11 in urgent care settings. Dr. Myers finished her Sports Medicine Fellowship with San Diego Sports Medicine & Family Health Center in July 2014, and then joined our practice as a full-time provider on August 1, 2014. Previously, she completed her family practice residency in Downey, CA and a fellowship in osteopathic manipulative medicine at Western University, where she learned to incorporate osteopathy into the care of all of her patients. 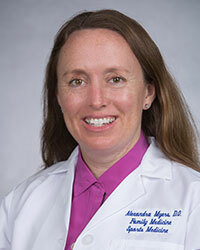 Dr. Myers completed her undergraduate studies in Biology and Spanish at Cornell College and is bilingual. Originally from Wrightwood, CA, Dr. Myers enjoys skiing, hiking, tennis, soccer, and surfing.